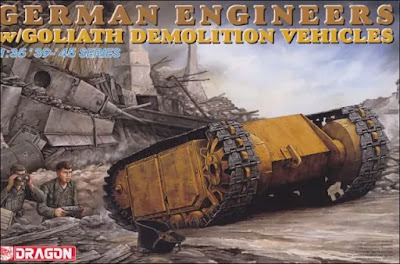 In late 1940, inspired by a French miniature tracked vehicle prototype it recovered from the Seine, the Wehrmacht Ordnance Bureau ordered Bremen-based automaker Carl F.W. Borgward to develop a similar vehicle, capable of delivering at least 100 pounds of high explosive to a target by remote control. In spring 1942 Borgward rolled out its SdKfz. 302, nicknamed Goliath, powered by two 2.5-kilowatt Bosch electric motors. Its limited range (less than a mile on flat surfaces) and high cost eventually led to its discontinuance. In late 1942 Borgward introduced the SdKfz. 303a, powered by a Zundapp two-cylinder gasoline engine with an improved street range of more than seven miles. Two years later it produced the slightly larger 303b, which could carry a 220-pound payload. 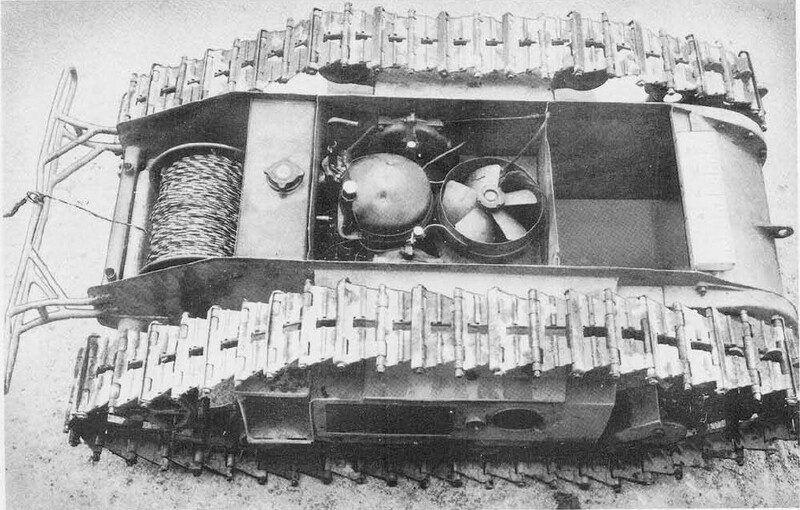 A view from above showing the motor and the control wire drum on the petrol driven Goliath. 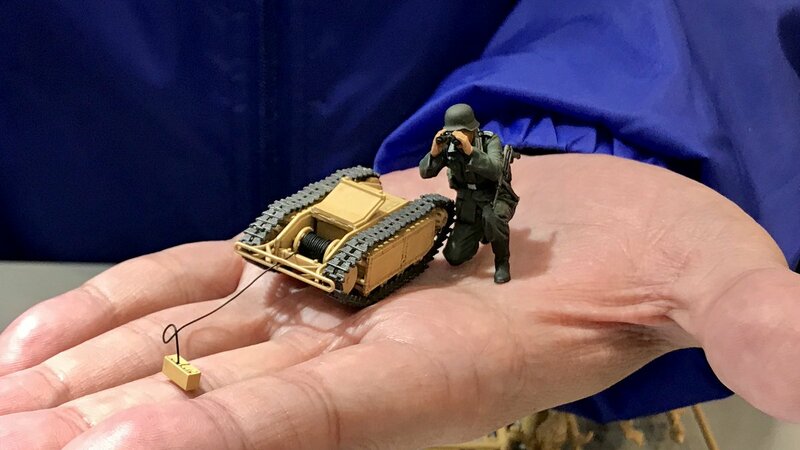 The open side showing internal guidance parts and battery on this version of the electrically powered version Sdkfz 303 we are looking at in this kit. A Goliath Sdkfz 303 out "in the wild"
Goliaths were used on all fronts where the Wehrmacht fought, beginning in early 1942. 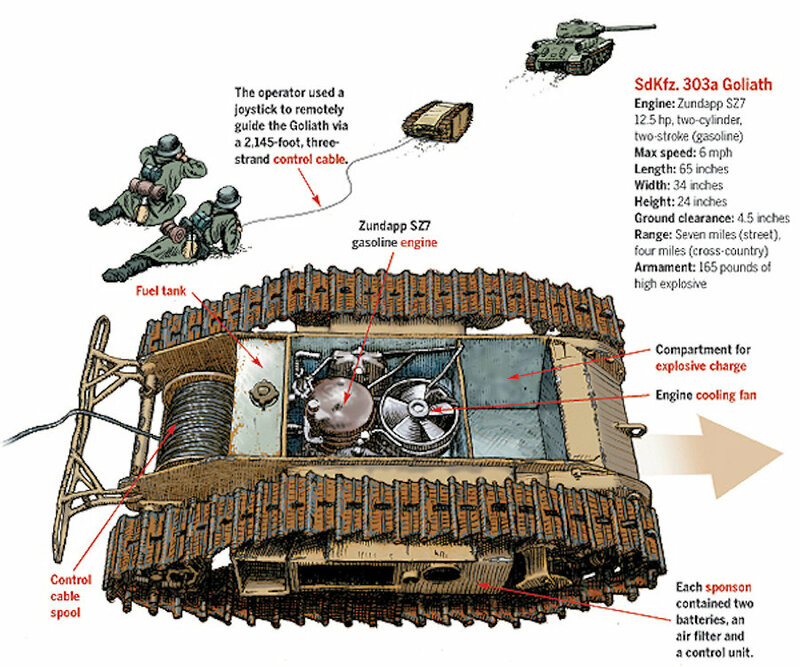 They were used principally by specialized Panzer and combat engineer units. Goliaths were used at Anzio in Italy in April 1944, and against the Polish resistance during the Warsaw Uprising in 1944. 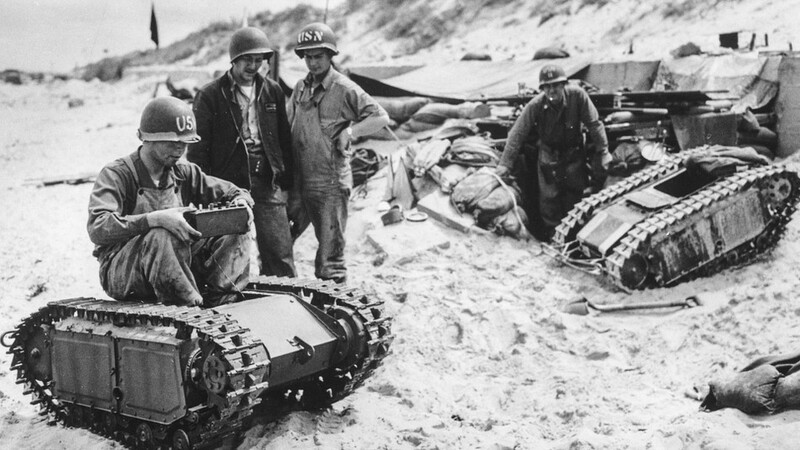 A few Goliaths were also seen on the beaches of Normandy during D-Day, though most were rendered inoperative due to artillery blasts severing their command cables. 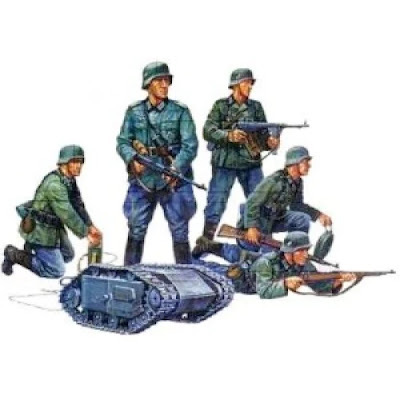 Allied troops also encountered a small number of Goliaths in the Maritime Alps following the landings in southern France in August 1944, with at least one being used successfully against a vehicle of the 509th Parachute Infantry Battalion. 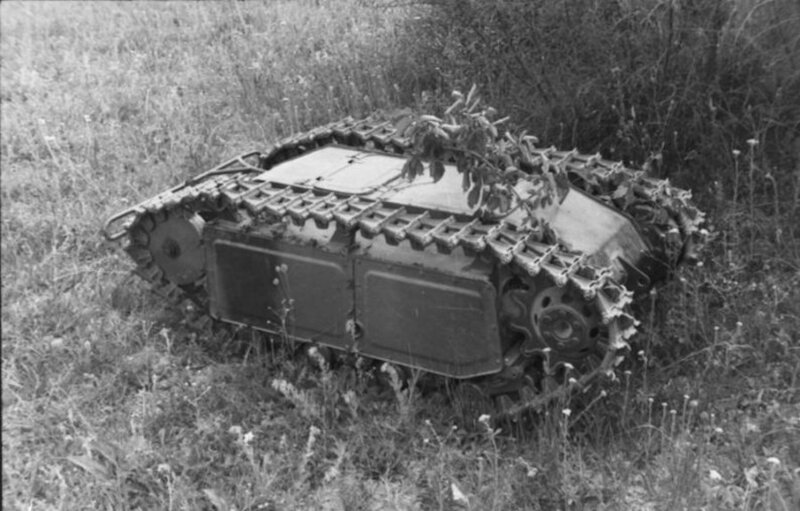 Although a total of 7,564 Goliaths were produced, the single-use weapon was not considered a success due to high unit cost, low speed (just above 7 miles per hour 11 km/h), poor ground clearance (just 11.4 centimeters), the vulnerable control cable, and thin armour which could not protect the vehicle from small-arms fire. 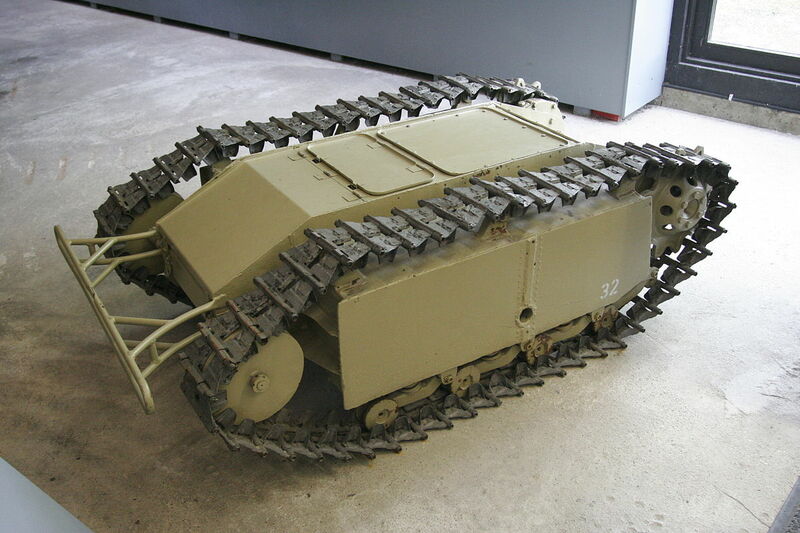 The Goliath was also too big and heavy to be easily man-portable and a trailer was used to pull the goliath along. Mostly, they failed to reach their target although the effect was considerable when they did. 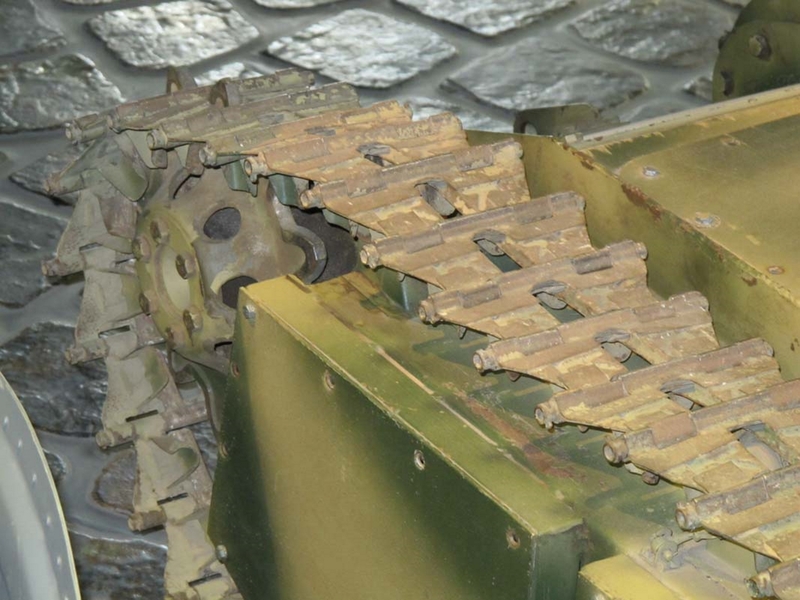 Operators used a joystick control box connected to the vehicle by a 2,145-foot triple-strand control cable—two strands for steering, one for detonation. 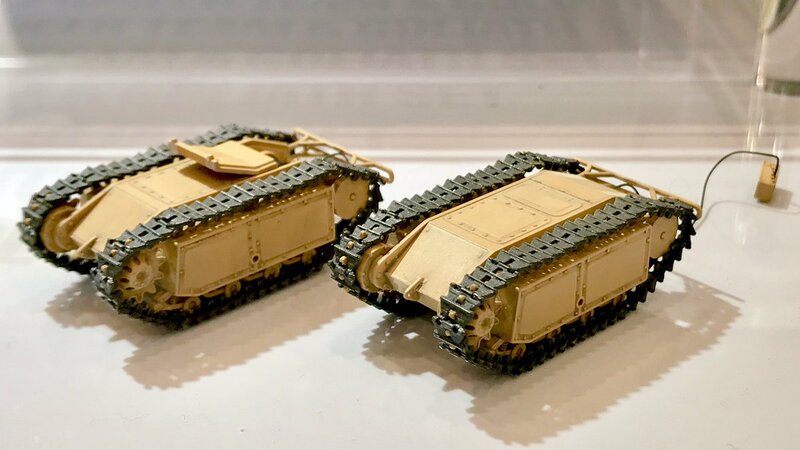 Issued to combat engineers and special armoured units, the Goliath was designed to disable enemy tanks, disrupt infantry units or demolish strongpoints. 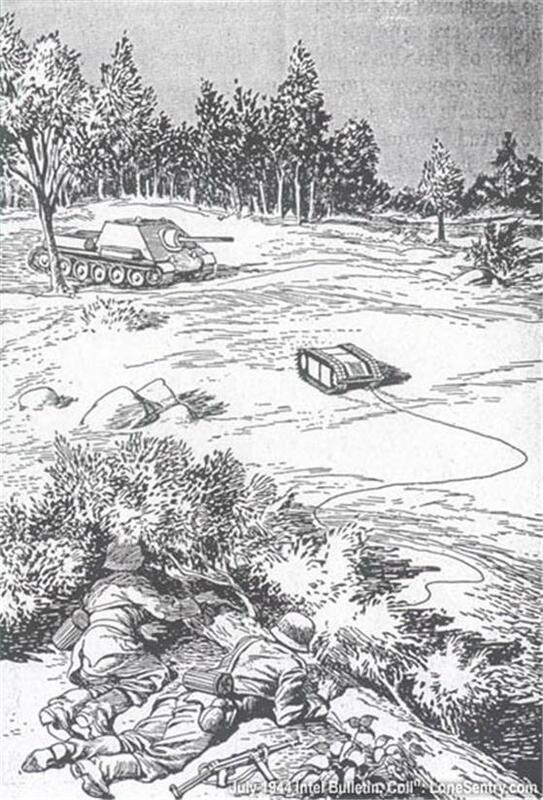 Its control cable proved vulnerable to cutting, however, most notably when the Germans deployed it against the Polish Home Army during the 1944 Warsaw Uprising. 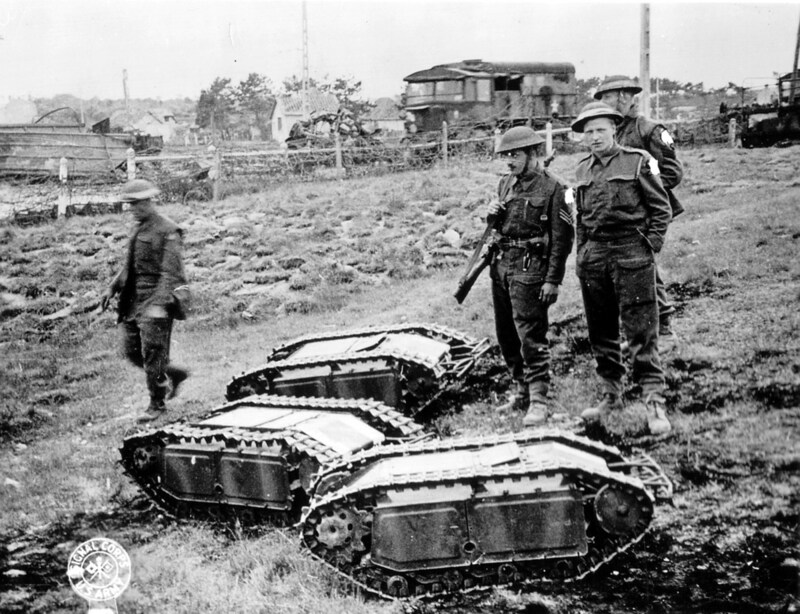 Though the Goliath saw little use, it did serve as the precursor of the modern radio-controlled robotic vehicles. 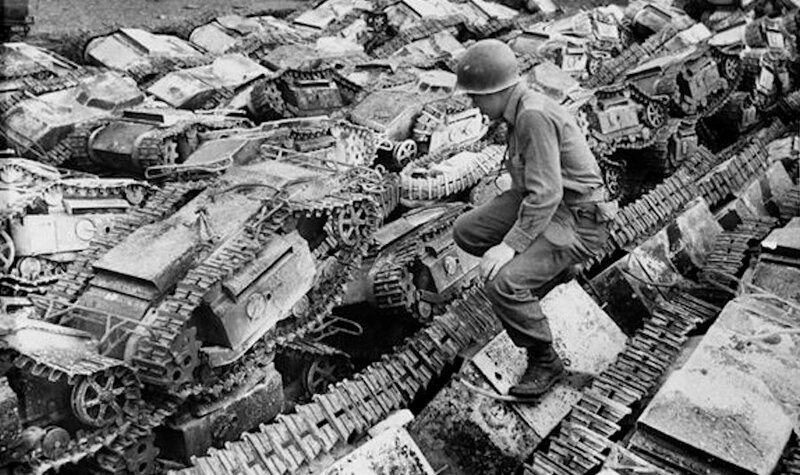 The Allies called it the “beetle tank.” Large numbers of Goliaths were captured by the Allies. 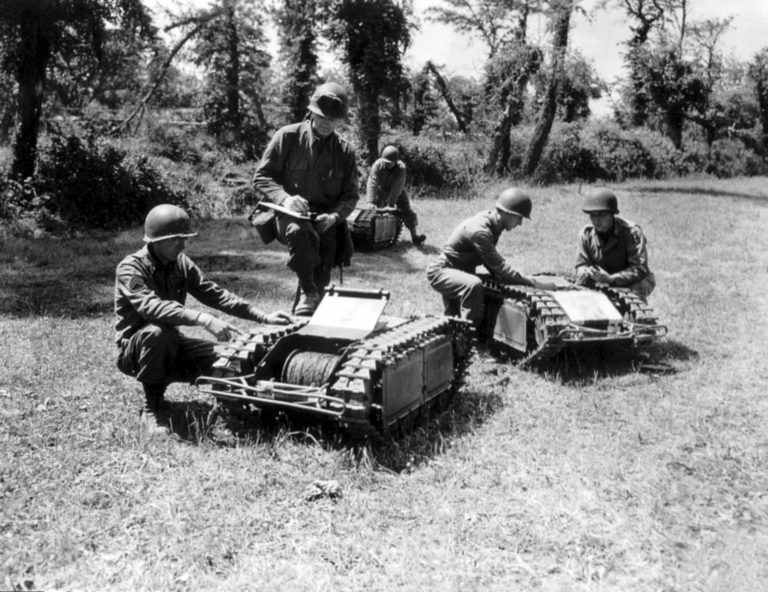 Although they were examined with interest by Allied intelligence, they were seen as having little military value. Some were used by the United States Army Air Force as aircraft tugs, although they quickly broke down as the disposable vehicles were not designed for sustained use. 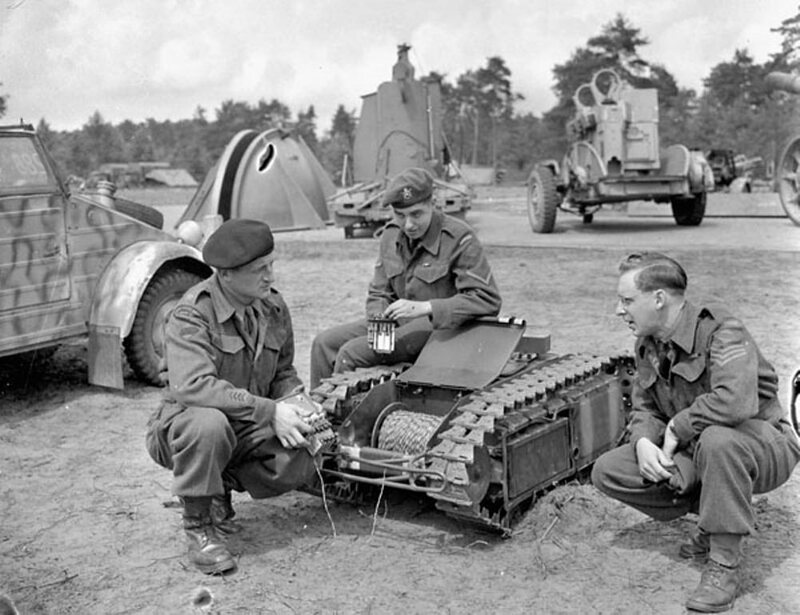 The Goliath did help lay the foundation for post-war advances in remote-controlled vehicle technologies. 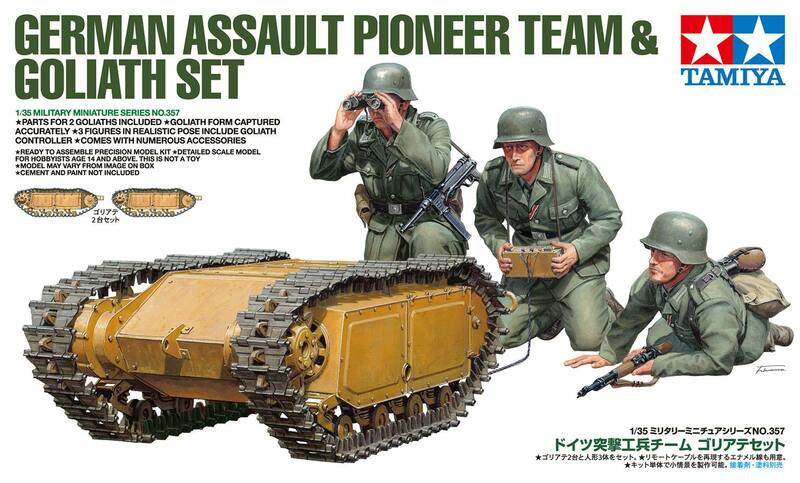 The kit features the parts for two Goliaths & three early-to-mid-WWII German Army Pioneers to control them. 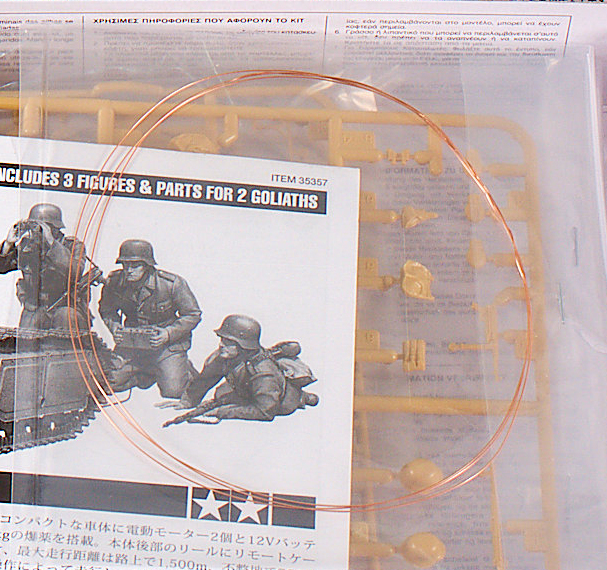 There are four sprues in the box with 111 parts in tan plastic and some fine copper wire for the control cable. 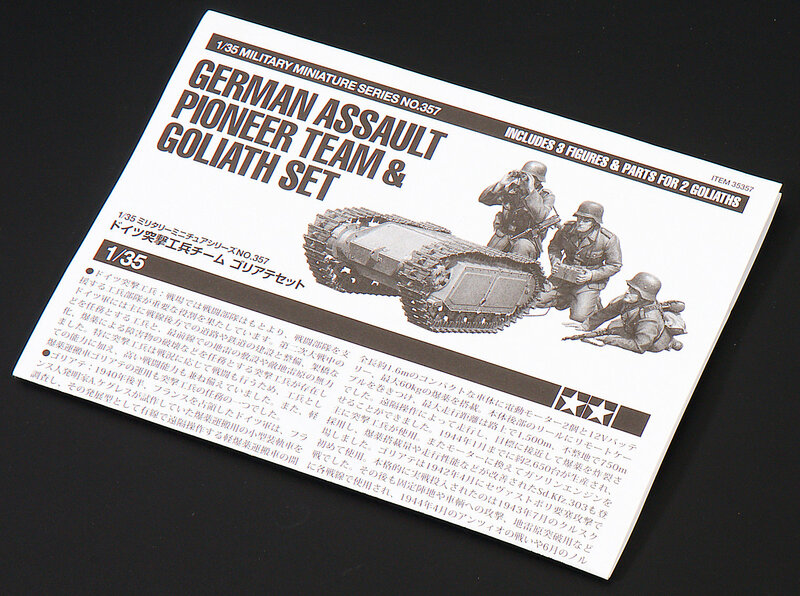 The set provides two complete Goliath models, each made from thirty-nine parts. The tracks are simple link and length tracks. 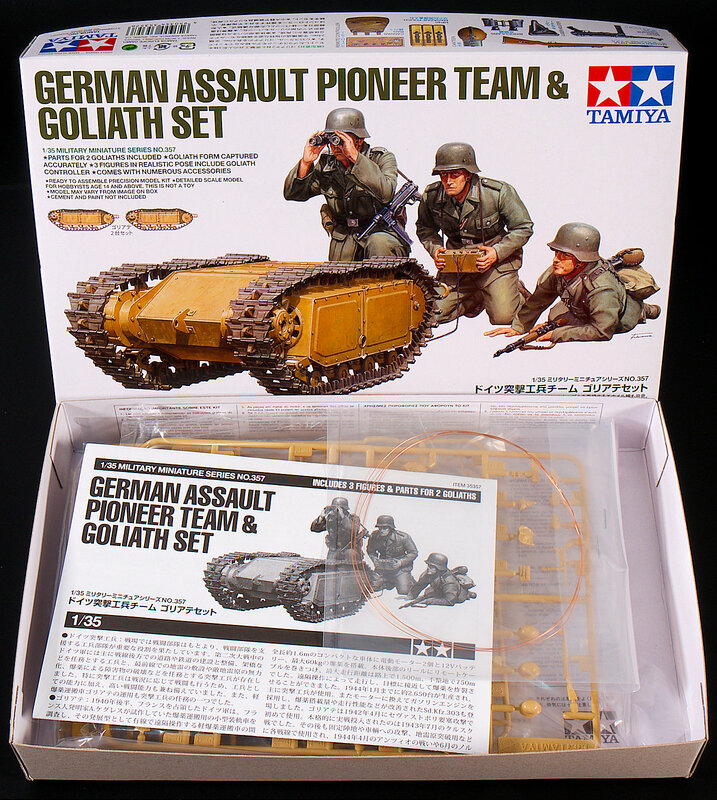 This is not the first goliath that Tamiya has made, they released a 48th Goliath along with the Kettenkrad set a few years ago. 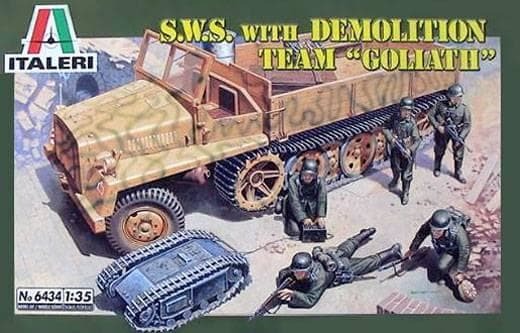 This is not the first Goliath made in 35th either, with the Dragon models "Engineers w/Goliath Demolition Vehicles", the "Leichter Ladungsträger "Goliath" Modell B Sd.Kfz 303 from Scale Model Accessories Ltd, the "Schweren Wehrmachtsschlepper mit Goliath-Team" from Italeri and lastly the "Sprengpanzer Goliath German Assault Engineers" from Esci which is a REALLY old kit now. 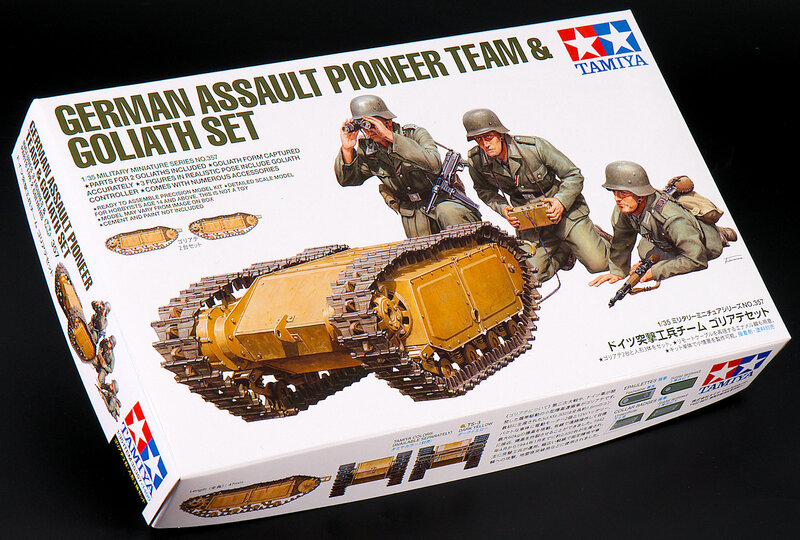 The kit box - all in the classic Tamiya white - features the tracked min and three operators from a Pioneer squad guiding the machine forward. 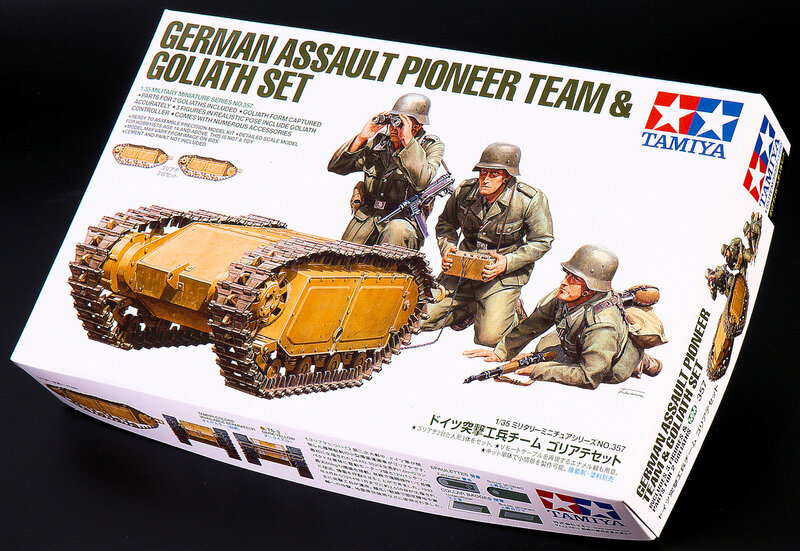 There are the regular painting instructions of the soldier's accessories and the Goliath's themselves on the side of the box in that Tamiya fashion modellers are familiar with. This box opens up to reveal not very much inside. Simply four small sprues in the box with 111 parts in tan plastic and some fine copper wire for the control cable with a small paper instruction manual. The instructions are the usual white paper with cute drawings of the kit and the figures that go along with it. 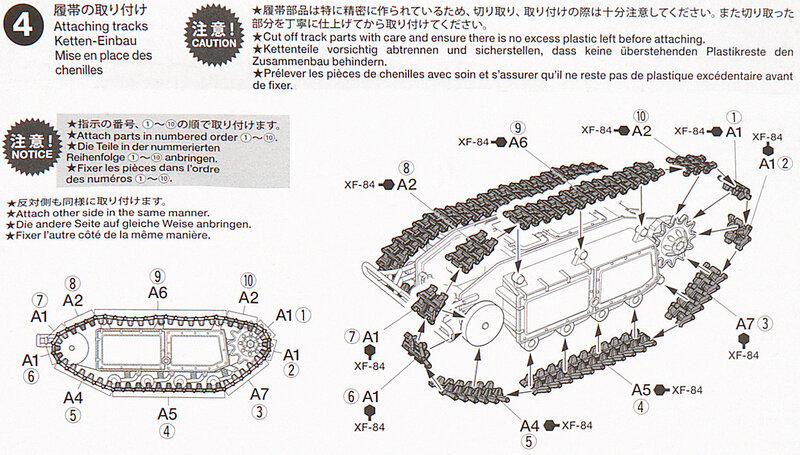 The usual warnings in Japanese, along with instructions in German, French, English and Japanese. Black ink on white paper, these eight steps are concise but also point out just where you need to be with the kit at each point of making the model and figure construction. Paints are mentioned in this kit on a diagram, but no camouflage patterns or guides are pointed out. We have colours mentioned in the shading of the figures, but there is SFA mentioning the colours of the Goliath's themselves. 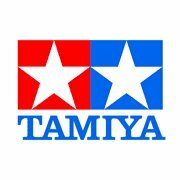 I did find this profile on the Tamiya Website and it is on the box side also. Inside the box, there are four sprues in grey plastic in the production kit. I had seen a set in grey sprues, but those are the test shots or early runs. 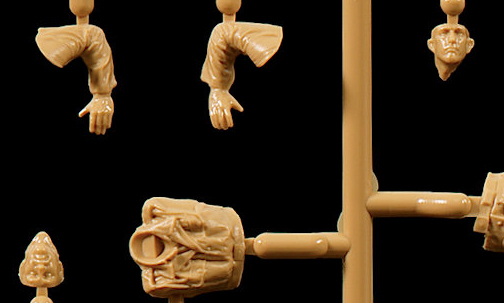 The main production line is in a tan colour. 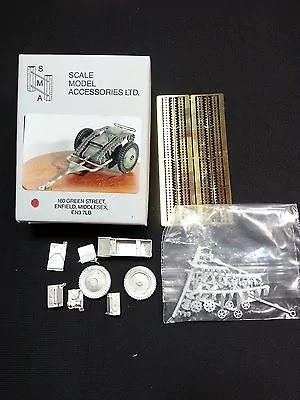 As you would like to see in Tamiya's work, the moulding of the plastic is done smartly, with no unnecessary sink marks, ejector pin circles or that much if any flash on the kit. There are some slight seams on the figures and one side of the Goliath running gear but these were all too easy to remove ( as you will see when I show you how it builds). Slide moulds were used to create some parts and the tiny tracks are really finely moulded. 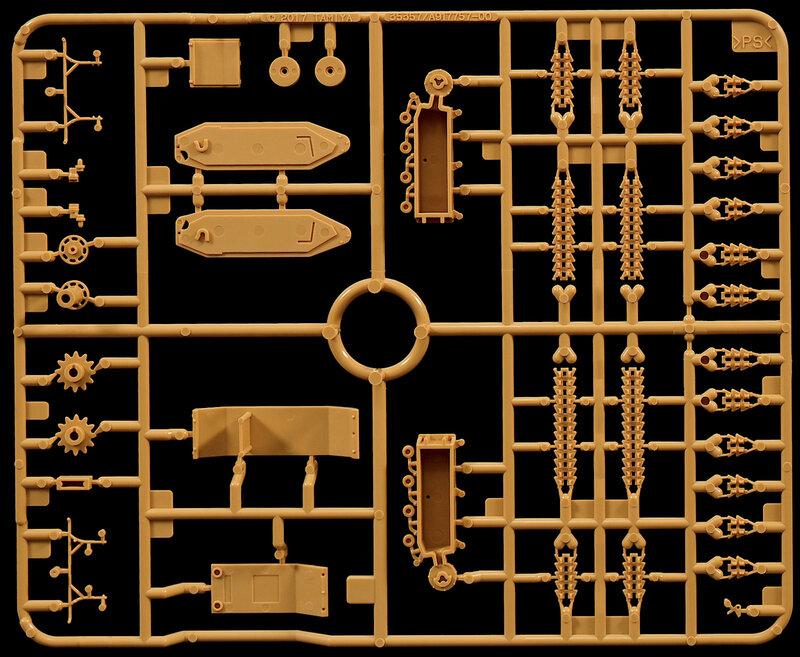 This is a duplicated sprue in the kit which houses everything you need to make the Goliath SdKfz 302 version. 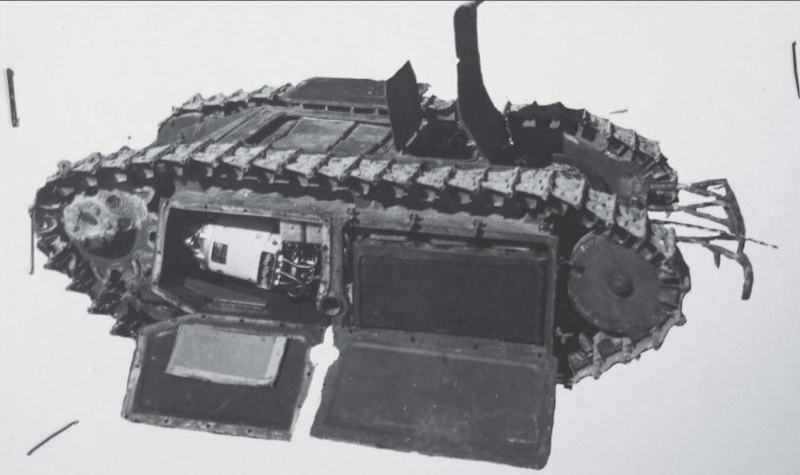 There are no internal parts included but the round drum that coils the electrical control cable and the controller for the tracked mine. Everything is here - the tracks, the rear bumper looking thing which the wire unravels onto. Also the drum and the flap which opens up to access this port. The flap is too thick for my liking and if you want to pose this up you could use plastic or tin from a can to replicate the thickness of the hull. Part A22 is the remote control for the Goliath. 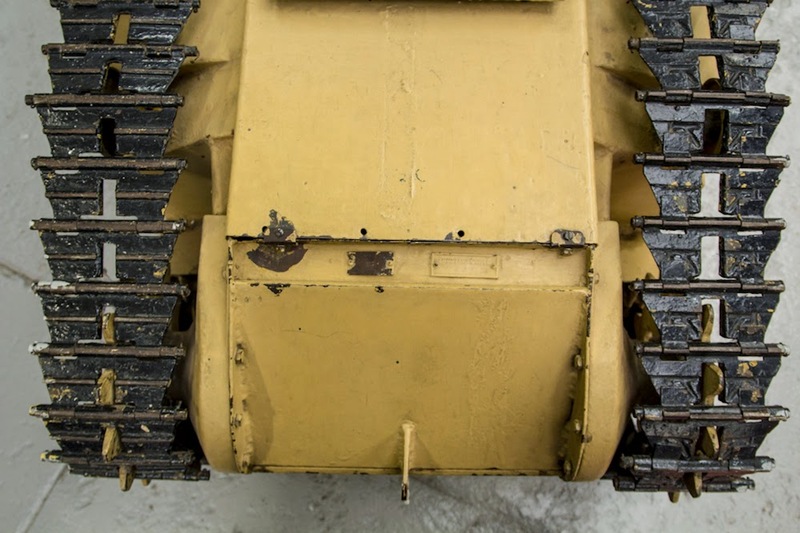 A closer look a the Goliath's thin tracks. These link and length tracks are moulded slack on top of the run to replicate a sag on them as they pass over the return rollers. 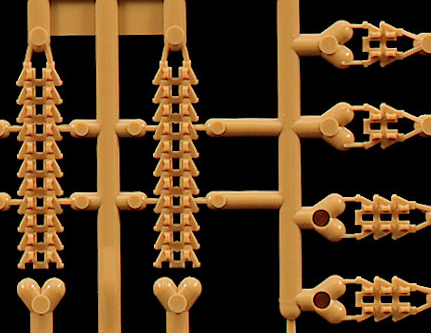 There is one sprue B. This sprue houses the three soldiers/ operators/ pioneers, their weapons, ammo and equipment. 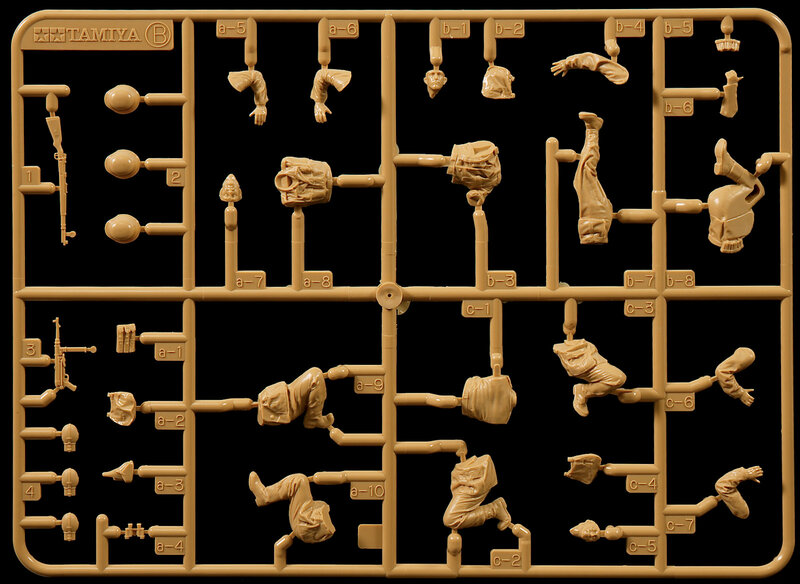 The three figures are not grouped in a single "clump" on the sprue which would be nicer, but you cannot really get these wrong when you put them together unless you try. The uniforms, the weapons and the equipment is nicely sharp in deail and I was impressed at the lack of seams on the bodies of the pioneers. 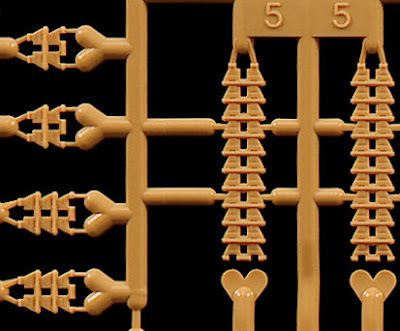 The reverse of this sprue shows the easy mating of the flat surfaces of the figures, when it comes to making these they were a cinch to assemble, the use of notches and hollowed out parts to help the correct fit are in the realm of resin figures and although there was a little to trim here and there, nothing major. The Kar.98, Mp 40, pistol holster ammo pouches, bread bag, flask and optical glasses were pretty well moulded I thought. A closer inspection of two of the three faces shows them nicely moulded and realistic. Painting these will be simpler than having to fix the flat features you might see on many a figure we get from other injection moulders. 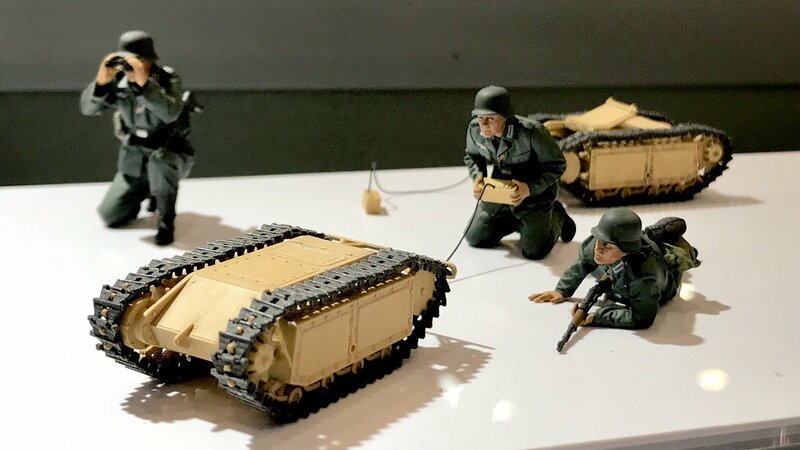 I am not sure that these are scanned from anyone ( like the Panzer Crew we looked at last year) but these are a good quality likeness to my eye. Brass Wire is also included to recreate the control wire. On the real thing this was a twisted thin wire, so maybe you can get a drill and twist these tight to each other. I think I will do that in my build. So that is all there is in this kit's box. 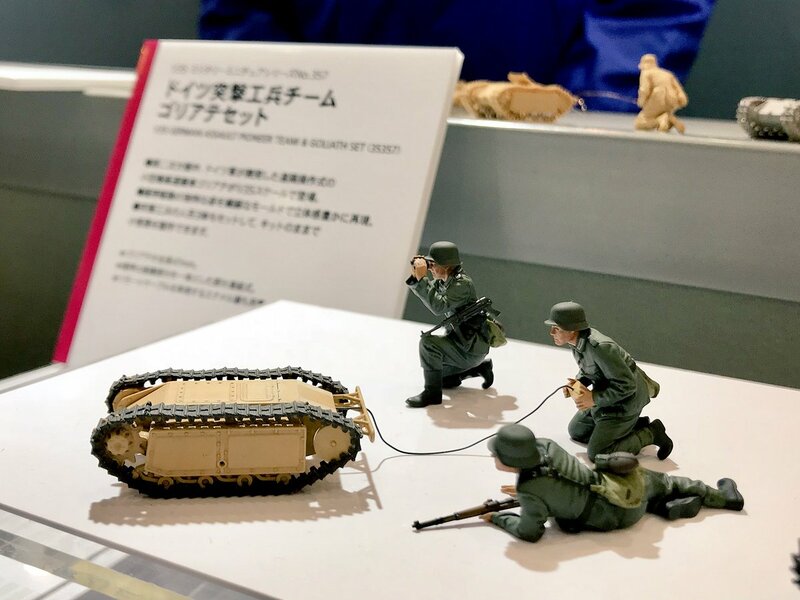 This model has promise, but don't ask me other than a curiosity value why Tamiya made the Goliath, a tracked vehicle that has been made before a few times in this scale. I do understand the psyche of wanting to make something that is so small as well as destructive so fair play. It got me to buy one!